With white sharks now reliably returning to the area every summer and fall, Cape waters are a laboratory for scientists hoping to learn basic information about the apex predators, including how many there are, where they travel, and where they breed. But recently, longtime state shark biologist Greg Skomal said that multiple studies in the area could compromise the science that all agree is important to understanding white sharks. Skomal and his team, working with the Atlantic White Shark Conservancy and UMass Dartmouth’s School for Marine Science and Technology, are in the third year of a five-year study looking at the shark population off the coast of Massachusetts. From mid-June through October the scientists plied state waters, spotting sharks from vessels and planes and using camera systems to identify and catalogue sharks. More than 100 different white sharks were counted this summer alone, Skomal said, and over time the data will help scientists estimate the size of the shark population. This is important for conservation efforts, he said, and also for public safety, by helping scientists learn more about where shark territory might overlap with where humans like to swim. For the past several years state scientists have also worked alongside Ocearch, a Park City, Utah–based nonprofit organization that occupies an odd position within the scientific community – part publicity machine, part research facilitator. The crew itself is not comprised of scientists but of fishermen, who catch and tag sharks with telemetry tags that upload data to social media: Mary Lee, a sixteen-foot female tagged off Cape Cod in 2012, now has more than 101,000 Twitter followers. 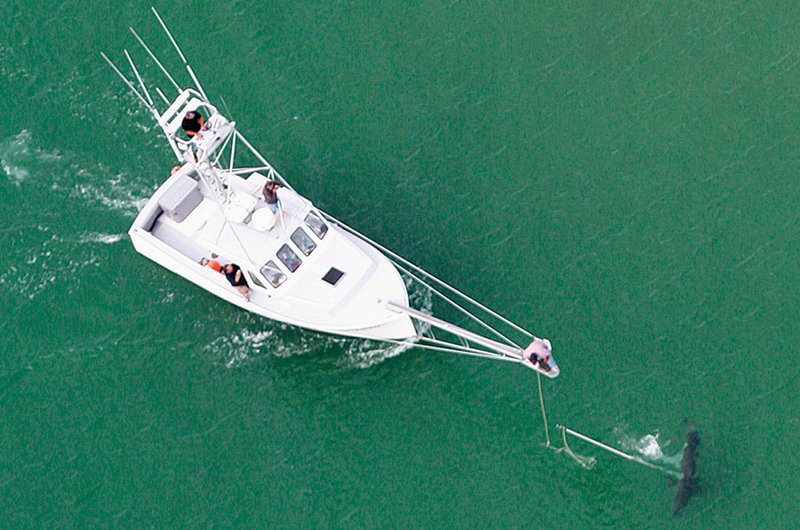 Scientists are invited on board to conduct their own studies on the sharks captured. In 2012 and 2013 Skomal and fellow state scientists collaborated successfully with Ocearch on shark-tagging expeditions off Massachusetts. Ocearch research has shown, among other things, that sharks travel much farther than previously thought – one of the sharks tagged during those missions, Lydia, traveled 35,000 miles in two years after she was tagged. Ocearch proceeded with the trip anyway, using a federal permit to tag sharks off Nantucket, just outside the three mile state jurisdiction. During “#Expedition Nantucket: The Search for the Next Mary Lee,” which took place over nine non-consecutive fall days, six sharks were tagged. Though Fischer was “really surprised and disappointed” that Skomal didn’t mention concerns earlier, he said Cape Cod is “the only place in the North Atlantic where there’s predictable access to white sharks, especially mature white sharks. It’s not like we could just go somewhere else...Massachusetts is the only place we know the white sharks are gathering in the late summer, fall, early winter in the northwest Atlantic.” He said Ocearch hopes to return to the area in the coming years and hoped to work again with Skomal’s team.